Being preoccupied (to say the least!) with baby on the way, I haven't been a very good blogger when it comes to feltmaking and fiber arts. My apologies! Hopefully, today I can rectify that a bit by posting a recap of some useful feltmaking resources as well as sharing a nuno felted scarf that I completed a few weeks ago. As some of you might have read in my previous post, I was suppose to do a feltmaking demo for a fiber arts class on Wednesday, but due to my contractions and order of rest by the doctor's office, I just couldn't physically do the tutorial that I had planned. I did however make a little info sheet for the class with some feltmaking resources listed. I thought that I'd share those with you. Some of the info, I have posted before, but it has been several months so I thought that a recap might be appreciated, and perhaps it will redeem myself for being so very neglectful in not posting more fiber art and feltmaking related things. Below you'll find some of my favorite resources - both in print and online. Please be aware that what you see below are just a few of the numerous good sources to go to for information and supplies. There are many, many more! And, if you are interested in expanding your horizons, I also suggest that you check out my blog roll in the right hand side bar. 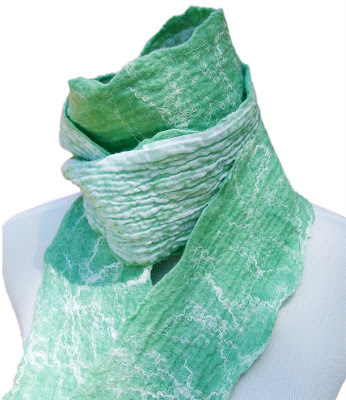 It is filled with fiber art and feltmaking related blogs. Also, please feel free to leave a comment with your favorite information and supply resources. I love it when readers share, and I learn so much! So that's my little recap of feltmaking information and supply resources. I hope that you find it to be somewhat useful and decide to add your own suggestions in the comments. 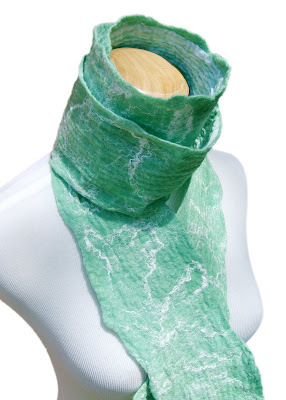 Now on to my Show-and-Tell for the day........ a nuno felted scarf. I made this scarf a few weeks ago and had forgotten to post it until today. As you might notice, I am also working on my photos. I've decided to clean up the backgrounds and stick to a basic white. So far, I think it is working well and looks more professional, but you can let me know what you think. Join in and "dish." ...I came upon you by way of clicking "Etsy" as interest. wow, so beautiful. I just adore the color! But if you make one catalog is very important to have a same background or backgrounds in harmony. And harmony can be the same tema in variations, nature, doors, windows, walls (my favorite, what i would like to do), the sky, wool, glass etc. Free video tutorials on felt making.